Why not advertise your jobs with us? Environment Analyst offer an extensive platform for you to effectively promote your job vacancies to a targeted audience of environmental professionals. Why not let our dedicated sales team help create the best job package for you, tailored to suit your needs. Contact us today to find what we can offer you. 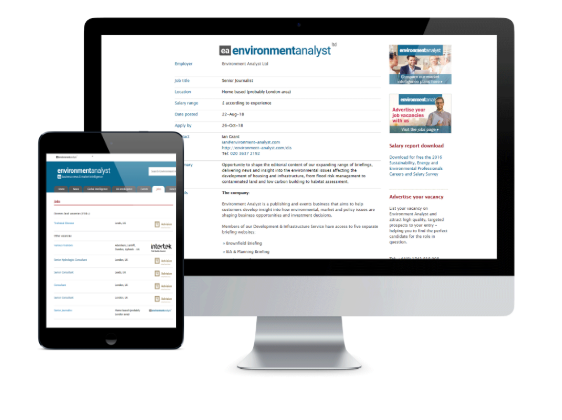 To find out how we can help you showcase your job vacancies to targeted audiences, call us on +44 (0)20 3637 2191, email sales@environment-analyst.com, or fill out our job form online. - Chris Macleod, SLR Consulting Ltd.
- Andrew James, ESI Ltd.